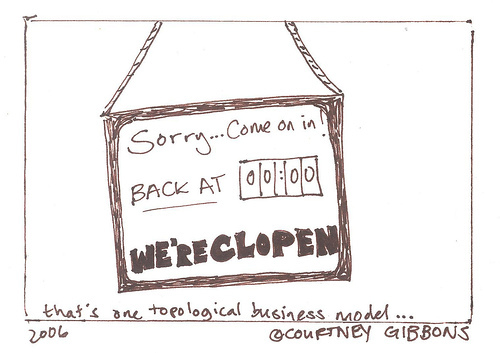 In topology, a clopen set (a portmanteau of closed-open set) in a topological space is a set which is both open and closed. That this is possible for a set is not as counter-intuitive as it might seem if the terms open and closed were thought of as antonyms; in fact they are not. A set is defined to be closed if its complement is open, which leaves the possibility of an open set whose complement is itself also open, making the first set both open and closed, and therefore clopen. In any topological space X, the empty set and the whole space X are both clopen. Now consider the space X which consists of the union of the two intervals [0,1] and [2,3] of R. The topology on X is inherited as the subspace topology from the ordinary topology on the real line R. In X, the set [0,1] is clopen, as is the set [2,3]. This is a quite typical example: whenever a space is made up of a finite number of disjoint connected components in this way, the components will be clopen. A topological space X is connected if and only if the only clopen sets are the empty set and X. Any clopen set is a union of (possibly infinitely many) connected components. If all connected components of X are open (for instance, if X has only finitely many components, or if X is locally connected), then a set is clopen in X if and only if it is a union of connected components. A topological space X is discrete if and only if all of its subsets are clopen. Using the union and intersection as operations, the clopen subsets of a given topological space X form a Boolean algebra. Every Boolean algebra can be obtained in this way from a suitable topological space: see Stone's representation theorem for Boolean algebras.